Jazzy Dance Company wins 3rd place at the Puerto Rico World Salsa Open in the Team Division!! Out of 8 teams from different countries that qualified for the finals, Jazzy was the only one from the USA. 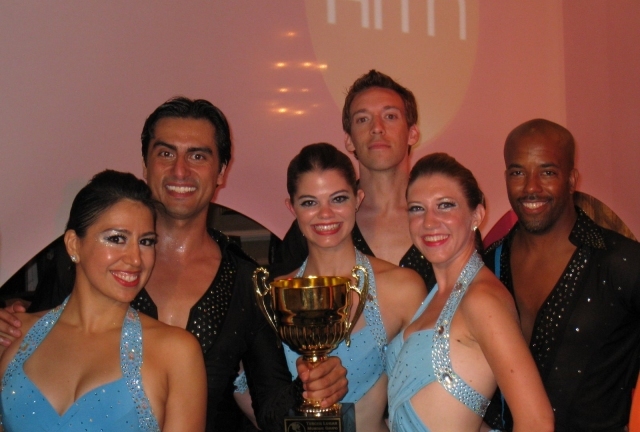 We are happy to have represented Texas and the USA at this World renown Salsa Open! Click here for videos of all competition routines! We are beyond excited to share with you this past weekend's events. After 9 days of beach and sunny days, we arrived yesterday from San Juan with tired bodies but a very happy spirit ! 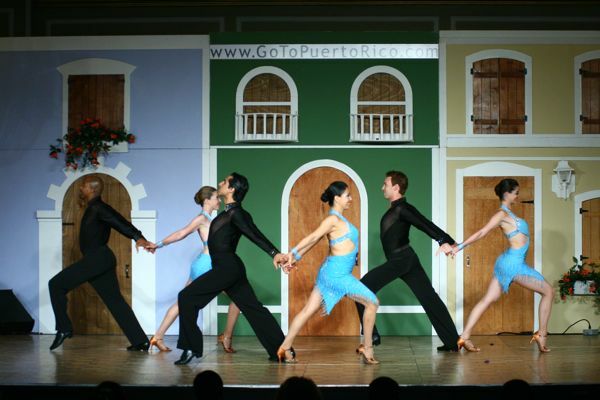 As a dance team, we hadn't really considered competing in the World Salsa Open in Puerto Rico. But destiny had something else in store for us. At the beginning of June, we got invited by Jayson Molina to compete in the team division after he had seen our Zip zap routine on video. And in spite of the fact that we hadn't really planned to make that expensive trip, we decide purely on faith that it'd be worth a try. So the 6 of us along with some of our Jazzy dancers/students, rushed to get airplane tickets and rent a condo so we all could stay in one place and save in lodging. It was an exciting transition during our team rehearsals. We were now focusing on a competition and it meant a lot more work and more synchronization of the 3 couples that would be on stage. But nothing comes for free or by chance. As Seneca wrote: “Luck is what happens that when preparation meets opportunity”. We had been rehearsing consistently for the past 8 months or so and by the time that we got invited to compete at the Worlds, we had already performed our routine many times in front of different audiences and made the necessary changes to improve it. We were ready and all we had to do is perform one more time with as much perfection as we could muster in front of the judges. The day of the finals we were nervous as expected. None of us had ever competed in Puerto Rico or in a team division. This was very new for us and at the same time comforting because we had each other: Catie, Robert, Barbara, David, Carlos, and I were backstage when they announced us next; we were supposed to be #5 out of 8 teams, but team #4 didn’t have their music ready. So they asked us to go before them. Without hesitation the 6 of us nodded that we were ready to go. We got on stage and the two and a half minutes went by in a blurb. We hit our final pose and bowed for our exit. The crowd seemed very receptive to our routine even though they were heavily rooting for the two Puerto Rican teams. We were afraid that they wouldn't like our style since it’s very different from the Puerto Rican style. But at the same time, we focused on doing our best and giving a great show. When they asked all 8 teams on get on stage to give the results, I think none of us had thought we would place top 3. So when they announced: “Tercer lugar.... de Texas, Jazzy Dance Company”, we all stood still because it hadn’t really registered that they had said it was us for third place! Finally Carlos and I reacted and stepped forward to receive the trophy, then David, Barbara, Robert, and Catie followed. It took us a while to understand what was going on and then we jumped up and down full of excitement and still in shock! I feel blessed to have had the opportunity to receive a trophy with the words “Third place in team division, World Salsa Open Puerto Rico 2008”. For Carlos and I as directors of Jazzy, that was a huge achievement and a lot of team work not only from the 6 dancers that were on stage, but also from our friends and supporters who believed in us and cheered for us along the way. We want to thank Richard Huang, Valarie Brown, and Elisabeth Poigin for being there with us, cheering for us and videotaping the entire competition. You were the best cheer we could ever have had !!! I am glad that we went after our dream and that we didn’t let fear get in the way. It’s so easy to tell ourselves that we are not good enough or that we don’t have what it takes to go after our dream. But there’s always a way. And the rewards are so worth it !